The European eel has one of the most fascinating life-cycles on earth. Beginning life as a leaf-shaped larvae in the Sargasso sea, they make an amazing trans-Atlantic migration to the freshwater rivers of Europe, where they feed. It is a species very much under threat however; with numbers in catastrophic decline since the 1980s. This is seen in the fisheries for yellow and silver eels, as well as in surveys of the number of glass eels that are returning to Europe. Exactly what led to this decline is hard to pinpoint, but a recent study suggests that their extraordinary, ocean-going life cycle may be one element. However, there is exciting news at the moment of the third successive year of rising eel catches in France and this may suggest that the eel’s drastic decline in numbers has finally bottomed out. Published in the journal Current Biology, new research (see link given below) focused on addressing this population collapse, to try to understand how and why it occurred, and what the consequences might be. While these questions on the fate of the eels are still largely unanswered, the combined effort of biologists and oceanographers did discover a possible link between the fluctuations of young eels numbers reaching Europe (known as eel “recruitment”), and the variation of major ocean currents. Under natural conditions, the abundance of eels that arrive in Europe depends on the variation of the North Atlantic currents. So the circulation of water in the eels’ spawning ground play a major role in the number of eels that successfully reach Europe. Using the latest oceanic model this work simulated oceanic currents observed during the 45-year period between 1960 and 2005. 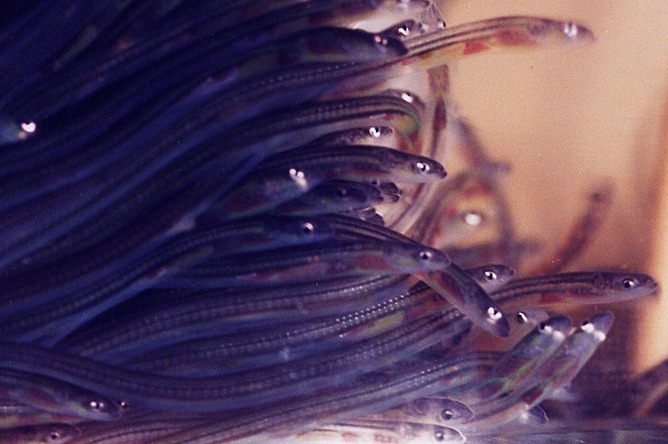 Seeding the model with eight million virtual eels, the authors compared their transatlantic progress predicted by our model with actual eel recruitment data collected since the 1960s. What was discovered was that the model’s predictions of eels reaching Europe matched the real numbers observed over around 20 years. A specific ocean pathway connecting the Sargasso Sea and the Gulf Stream is of vital importance. These simulations revealed that any disturbance here has a severe impact on the chances of eel larvae successfully arriving in Europe’s continental ecosystems. Interestingly, these connecting currents are weather/wind-driven. This observed link between difficult currents for eels in the Sargasso Sea seemed to match their decline starting in the 1980s, supporting one of the possible theories that the ocean itself contributed to lay behind the collapse of eel recruitment.